Secret Service protection for President Donald Trump's two adult sons cost more than $230,000 in one month last year, according to documents obtained by a government watchdog. 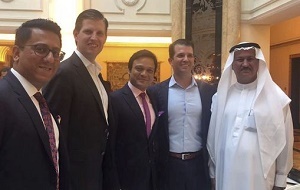 Per documents made public Wednesday by the Citizens for Responsibility and Ethics in Washington, the Secret Service spent more than $200,000 when Donald Trump Jr. and Eric Trump went to the United Arab Emirates to formally open the Trump International Golf Club in Dubai in February 2017. According to the documents released through a Freedom of Information Act request, the protective agency spent about $125,000 on airfare, another $75,000 on hotel rooms, and $15,000 more on other expenses such as transportation. A similar trip to Dubai to attend a wedding in April cost only $73,000, CREW reported. The nonprofit organization did not offer an explanation why the 2017 trip cost "significantly more." Also in February 2017, Eric Trump went to the Dominican Republic on a business trip, which cost more than $30,000 in travel and accommodations for his Secret Service protection. "When compared to the bill taxpayers were stuck with from Dubai, the Dominican Republic was a bargain," CREW said in a statement. CREW aims to "reduce the influence of money in politics and help foster a government that is ethical and accountable" through "aggressive legal action, in-depth research, and bold communications." Critics have accused the group of focusing its efforts more on Republicans than Democrats. The president signed a bill increasing Secret Service pay in April. The agency has been burdened with a crushing workload since the 2016 election. The size of Trump's family and the clan's extensive travel have expanded its protective mission further. Last summer, USA TODAY reported that about 1,200 Secret Service personnel had already hit their mandated pay caps, which were meant to last the entire year.